How are the ‘Pigs doing this year? OF Cameron Perkins has hit safely in his last 12 games. INF Taylor Featherston has hit safely in 15 of his last 16 games. 1B Brock Stassi has reached safely in 13 of his last 14 games. OF’s Will Venable and Cedric Hunter are starting to heat up. OF Nick Williams, who got his first AAA HR the other day in Moosic, has been off for a couple days nursing a minor injury. He is expected to return tonight. Some movement this morning as LHP Hoby Milner–who has been fabulous in two outings on the road, since switching his arm slot–and Reinier Roibal were sent to Reading. Sev Gonzales is back. A starter should be on the way, too, soon. I’ve heard rumblings that it will be Anthony Vasquez–but I’ll be watching tonight and tomorrow to see if Asher and Lively make their scheduled starts for Reading. All have been good. Plus when the Morgan call to the Phillies is official, a player will have to be moved there as well. Could be the return of Garcia or someone to the DL. The Buffalo Bisons come to town for the first time this season, which marks the return of our old friend Domonic Brown. The Bisons also have 1B Casey Kotchman, whom I remember cheering for with the Angels years ago, and Chris Leroux, who pitched well for us last season. Switch-pitcher Pat Venditte is also with the team. As far as prospects to watch from the Bisons, LHP Chad Girodo and INF Andy Burns are the players to watch. RHP Mark Appel (3-0, 1.62) is on the mound for the ‘Pigs tonight versus RHP Drew Hutchinson (0-1, 4.11). Promotions: Dorney Park will sponsor tonight’s post-game Friday Fireworks, and 5,000 magnet schedules will be given out courtesy Sacred Heart Hospital. Weather: Chance of showers and not all that warm. What are you wearing? (Uniform Watch): I made it through the first home stand without repeating a hat, and that will continue tonight. It’s our first look at the new Black Friday uniforms, which will now be paired with the road “storm gray” pants. I’ll probably be wearing black tonight, although I’ll have to monitor the weather to see which hat I want to get wet. I’ve heard they have the new authentic, on-field, Flex-Base jerseys in the store now, so I’ll be stopping to check them out although not purchasing. I know one guy who might, though. It was nice to wake up to the first place in the standings, with Pawtucket’s loss last night. As we approach May 1, it will be interesting to see what happens with the outfielders–especially Venable, who has an opt-out. It’s about time for Brundage to play the guys who are playing the best, most every day if they’re healthy. Nick Williams will be in there every night because he’s a prospect. Cam Perkins is hitting the cover off the ball. Sweeney (who also plays 2B), Marte, Hunter, and Venable if he stays–should all be fighting for that other spot at this point. I understand the Phillies will continue to rotate guys to the big club until they find a combination they’re comfortable with. Hunter was the guy to start, now Lough, and they keep Burriss up there for his positional flexibility. Cody Asche should be back some time after May 1, as well. Time for guys in the outfield to earn their playing time, is all I’m saying. 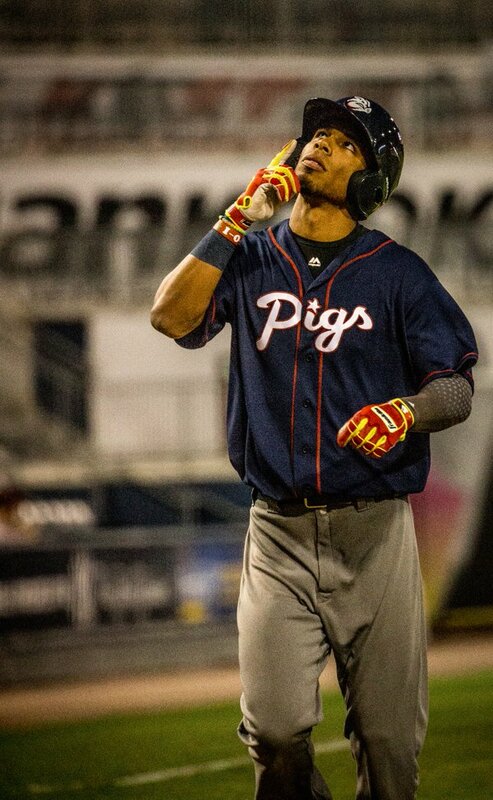 Pigs 2-for-1 swap pitchers with the Fightins: Roibal and Milner down, Sevy Gonzalez up. Fightins also swap hurlers with Clearwater: John Richy up, Joely Rodriguez down.